Footage from a police helicopter has captured the moment a dangerous driver was captured by cops - as he is jailed for two years. Wayne Young, 29, was spotted behind the wheel of a suspected stolen Ford Fiesta in the early hours of June 16. Officers turned on their lights to pull him over but Young started to drive so dangerously police had to abort the chase. Searches were conducted in the area and ten minutes later police located Young's vehicle near to Silverlink in North Tyneside. Young then led officers on a dangerous pursuit during which he clipped an oil tanker, smashed into police vehicles and drove through fields and cycle lanes. He also topped speeds of 80mph in a 30mph zone while driving on the wrong side of the road and failing to give way on roundabouts. Young was eventually stopped by police on a residential street in the Fenham area of Newcastle after officers were directed by the police helicopter. 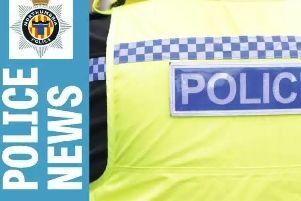 He later pleaded guilty to charges of dangerous driving, aggravated vehicle taking, driving while disqualified and without insurance at Newcastle Crown Court. At court yesterday, Young, of Tebay Drive, Slatyford, Newcastle, was jailed for two years and banned from the roads for six years. Now police have released footage from the National Police Air Service (NPAS) helicopter that shows the closing stages of the pursuit. Following the case, Northumbria Police's Motor Patrols Chief Inspector, Dave Gurthrie, said it was lucky nobody was killed. He said: "Wayne Young already had a string of driving offences to his name when he was spotted behind the wheel of a stolen vehicle. "What followed was some of the worst driving our traffic officers have ever come across and it is just through sheer luck that nobody was killed. "This is not something that is acceptable on our roads and Wayne Young put lives at risk through his behaviour that day. "Not only could he have killed himself but he could have killed a police officer or an innocent member of the public. "I am glad that a judge has jailed him for a lengthy period of time and also made it clear in court that this manner of driving is completely unacceptable. "This case shows that anyone who decides to use our public roads as a race track will face being put before the court and put behind bars."